The latest candle I’m ooo-ing and ahh-ing over is from Archipelago Botanicals, a luxury candle company I haven’t tried until now. The scent name is Expresso and Mocha and is part of their Home Collection. As far as I can see on ScentsandSprays.com, the site I ordered my candle from, Archipelago has many different candle collections that all look pretty tempting to me. Looks like I’m gonna have to get busy! I chose this candle because lately I’ve been dying to find a really authentic coffee candle. I just love the smell of strong coffee. Whenever I’m shopping in my local supermarket, I go down the coffee aisle just to get my fix of that awesome, rich aroma of all the different beans and blends. It really comforts me for some reason. Ever since I was little, I’ve been going in the kitchen cabinets and grabbing the coffee can to take a whiff… I know, I’m nuts, but hey, we all have our little querks, right? What did my Expresso & Mocha candle from ArchipelagolLook like? I have one word for you…sophistication. I LOVED the look of the packaging and the candle itself. As you can see in the pic to the left, my candle came in a modern slate colored Archipelago box that goes really well with the candle. 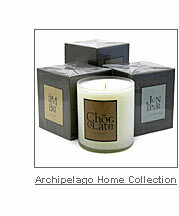 I love the design Archipelago chose for their home collection of candles. Very clean, simple, yet elegant. Besides a few White Barn New York candles I’ve had, this is one of my favorite candles in terms of looks alone. I think I mentioned before in a past review that I’m really big on design. I just love purchasing a product that has really cool packaging. I know it’s all fluff and usually you have to pay more for nicer packaging, but once in a while it just makes me happy to get something so chic like this. How did my Expresso & Mocha candle from Archipelago smell? I love this candle! What a rich and realistic smelling candle for the coffee connoisseur. When I burn this candle, it reminds me of an awesome coffee shop we have in our local mall. When you walk by the little shop or even walk near the stores around it, the smell is incredible! The mixture of strong espresso, cappuccino and everything coffee literally saturates the air and makes me crave that perfect cup of joe. I get the feeling Archipelago added some other elements to this flavorful fragrance that aren’t in the description but obviously belong in a cup of coffee. There is a real smooth, creamy quality to this scent which I’m assuming is from the addition of some cream. I think I’m also detecting a bit of sweetness, which of course is probably a dash of sugar. Basically this candle smells like that enticing aroma that greets you when you first walk into a coffee shop with a hint of chocolate thrown into the mix. The scent of my candle is so rich and creamy and has such deep, warm notes of delicious espresso and chocolate…I love it! If you can’t go a day without the aroma of a fresh blend of coffee rising up from your favorite mug, I think you’ll love this candle. It’s definitely a winner in my book. The first few times I burned this candle, I could barely smell it. After the wax burned down a little though, the scent throw seemed to get much stronger. With some candles I burn that have a super-strong scent throw, they completely fill the air in my family room in about twenty minutes or less. I really felt like I was smelling this candle at it’s best after burning it for a couple hours. It’s definitely worth the wait though. Once I gave it a chance to really get going, it’s rich fragrance did a pretty nice job of filling my family room and a little beyond. In terms of overall scent throw, I would give this candle a 7.5 on a scale from 1 to 10…10 being the strongest of course. How did my Archipelago candle burn? My candle burned even, clean and long with no tunneling. I was very impressed with the slow burn. After experiencing my first candle from Archipelago, I have a great first impression of this company. I can’t wait to try more of their scents. I just wish they didn’t cost as much as they do. $28 for one candle is a lot in my book. If you like pampering yourself though with luxury items, maybe the hefty price tag of these candles won’t bother you. I guess I’m just gonna have to wait for a sale to pop up so I can try some more. If you love the smell of coffee and don’t mind spending a pretty penny, you’ve GOT to try this candle…I highly recommend it! It’s rich, warming scent will make your home smell just like Starbucks! The best part is, you won’t get the jitters from too much caffeine.